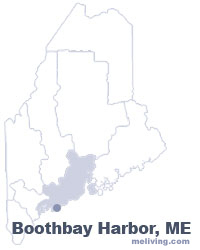 Boothbay Harbor was originally a part of Boothbay, but incorporated as its own town in 1889. Boothbay Harbor played an important role in World War II building specialized minesweeping ships for the U.S.Navy. It is also famous for having been the film location for the 1956 musical “Carousel”. Boothbay Harbor’s population more than doubles in the summer months as it becomes a tourist center with many recreational activities around the Harbor as well as the village of Boothbay. Topside Inn’s 20 guest rooms are spread among three buildings, situated just steps from each other on two acres. Water views greet you in every direction – sunrise and the famous footbridge across inner harbor to the east, the lighthouses and islands and out to sea to the south, and the western sunset. A delicious full breakfast is included with your stay. Casual dining on the water in Boothbay Harbor. Craft beer, full service bar, friendly service and fresh food cooked to order. Lobster Mac & Cheese, Fish Tacos, Roasted Chicken, Scallops, Mussels, Surf and Turf, Salads, Appetisers and Blueberry Mimosas. On the Water, at the Footbridge in Boothbay Harbor. Sensational waterfront dining in Boothbay Harbor awaits you. Award Winning Executive Chef Stephen's menu features reinvented coastal cuisine and focuses on simply prepared items made with the freshest possible local ingredients. Enjoy freshly caught Maine lobster and fish, grilled-to-order steak or enjoy a hearty sandwich, salad and local Maine brew in our intimate pub. Coastal Maine Botanical Gardens is a natural wonder of shorefront on the mid-coast Maine. Stroll 270 acres through spectacular ornamental gardens and miles of waterfront and woodland trails. Beautiful foliage, plantings, impressive stonework, waterfalls and fountains, and scenic views. One of Maine's top attractions. The Gardens are open 9-5 April 15 - October 31 (open until 6 pm in July and August). There is a cafe and gift shop on site. To share any Boothbay Harbor, Maine information, contact us. Learn more about advertising in MELiving.